Grow does not yet support the SUMPRODUCT spreadsheet function, so it can be difficult to calculate weighted averages. However, using SQL, it is relatively easy. In this example, we will be calculating the average price paid for supplies. 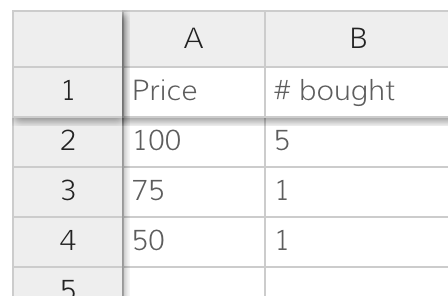 We purchased a different number of the same object at various price points and we want to calculate the weighted average price. We have this data in a Google Spreadsheet. After connecting our Google Spreadsheet (or you connect and select your data), the next step is to add a Master Report. This gives us the result we want. Which would only give the result once.